Solution to Nigeria’s mass killings and ethnic cleansing by Fulani terrorists in the country cannot be achieved by merely meeting some elements in the Nigerian government (who are actually part of the problem) but by organizing a referendum for those who desire to exit the expired country (1914—2014). It is worth stating right away, that Sam Brownback’s impending visit to Nigeria may not be successful. 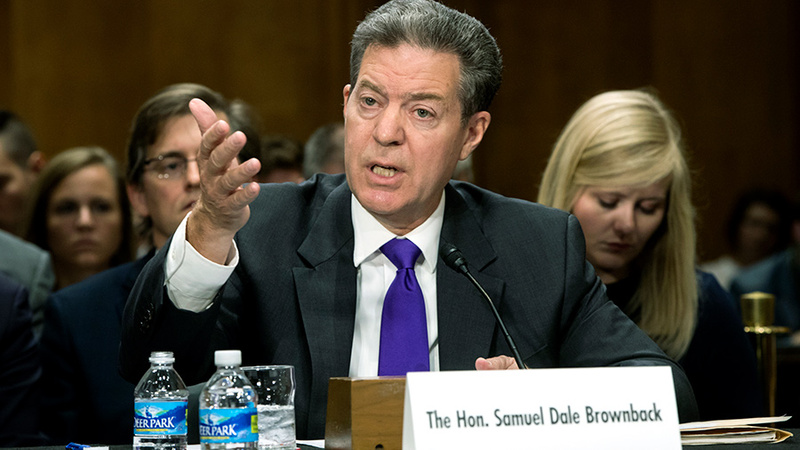 Sam Brownback is the Ambassador-at-Large of the United States of America (USA) for International Religious Freedom. And he is planning a courtesy visit to Nigeria to advocate and work for religious freedom. However, from the first time this writer learnt of his impending visit, the reason for it, and his itinerary, it became imperative to write this article to point out the seeming loopholes and why it might not work. According to the Spokesperson of the US Department of State, Brownback, during the one-week visit, would meet with government officials, religious leaders, and civil society groups. He would be doing so alongside Ambassador W. Stuart Symington. He stated that much progress needed to take place for the government to secure the right of religious freedom. “And remember, our effort is for religious freedom for everybody, regardless of faith, or even if you’re a person without faith, but that you are free to do with your own conscience whatever you choose and that no government has the right to interfere with that”. Good words, and good intention indeed but he is going about it the wrong way. The cities he would be visiting in Nigeria are Lagos, Abuja, and Kaduna. That means he would be meeting and consulting with killers of Christians who would not hesitate to lie to him about developments in the country. This means that Biafraland, the hub of Christianity, which is the major target of the Islamist fundamentalists in Nigeria (even from foreign Islamists) will not be consulted to give the inhabitants an opportunity for a fair hearing. So what then is the essence of consulting with those perpetrating ethnic and religious cleansing and not those being persecuted and slaughtered? How can you meet with those orchestrating the heinous killings without first meeting with the targeted victims of the killings? As if that was not enough, he would be touring Mosques and refugee camps. Didn’t somebody tell them that Muslims and Islamic Jihadists are the real perpetrators of the ethnic cleansing in Nigeria? Didn’t somebody tell them that ethnic cleansing is their inordinate project and that President Muhammadu Buhari and his henchmen in government are all in on the project? Didn’t somebody tell Brownback that Boko Haram, Fulani herdsmen, the police and military are all different arms and stakeholders of that project and that Buhari is the arrowhead? For this reason, Buhari and his government are the problem and cannot proffer or be the solution. Yes, the visit may not be successful towards ending Christians’ killings in the country, especially if he is coming with the mindset to change Nigeria’s Islamist fanatics like their chief point-man, Muhammadu Buhari, for the better. READ ALSO: Biafra: After a successful Sit-at-Home exercise by Biafrans, what new evil does the Nigerian Army have in the offing? For instance, Buhari is no human, but an animal in human skin. His obsession with Islam is legendary and it has turned him into a blood-cuddling machine. He started this mass-murder from the mid-1960s when he found himself in the Nigerian Army fighting in the Nigeria-Biafra war. He has not changed since then, and he cannot change now. When you are talking of Buhari, you are talking of a man who made this chilling declaration in Kaduna, in 2001: “I will continue to show openly and inside me the total commitment to the Sharia movement that is sweeping all over Nigeria”. What is “sweeping?” It is the bloodletting, the complete annihilation, the ethnic cleansing of the owners of the land in the contraption called Nigeria, and having the Fulani feudal lords take over those inherited lands. Take a look at the goings on, you will see that is exactly what Boko Haram, Fulani herdsmen and the military are doing in Nigeria today. And Buhari is their headman. Therefore, if Brownback truly thinks he can change Buhari or Nigeria for the better, he had better think again. Nigeria is beyond redemption. The only remedy to Nigeria’s woes and unworkable structure is complete disintegration. Rather than waste precious time, money and other valuable resources of the United States of America, on seeking to appease the Islamists, it is best he begins advocating for a referendum which will peacefully and legitimately enable Biafrans exit the Lugard’s Cage called Nigeria. Tell your government to quickly move for Referendum, so that the peoples who want freedom, peace, development, and progress can go their own ways to realize their dreams.